I love leggings, especially jeggings a.ka. jean leggings (leggings that look like jeans). Jeggings are more comfortable than the real ones, skinny jeans. During my last visit to the Philippines I really enjoyed wearing my jeggings because they suited our hot, humid climate. It's more airy than denim, plus, a real space-saver too! You can just roll it and stuff it in your luggage. I received my first pair of jeggings from a gorgeous friend in Tokyo. It's a bit faded now - proof that it has been used and washed dozens of times. So I need a new pair pronto. I am itching to buy these exciting leggings and jeggings by Mango, which are bolder in colours. There are also leggings that come in lace! But these Mango jeggings are totemo takai desu ne (super expensive). Okay - will just wait when they go on sale at the Mango Outlet website. 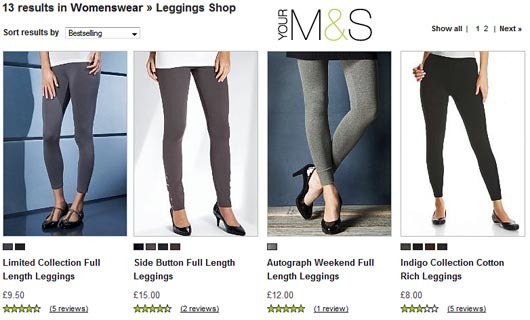 Or head to the nearest M&S this weekend as I just googled it, they also sell jeggings at more than half the price of Mango's! Honestly, I still like the styles of Mango's jeggings more. Oh HSBC, why did you increase my credit limit?